As Clara makes her way in a world that is frighteningly new, she discovers that the fallen angel who attacked her is watching her every move. And he’s not the only one. . . . With the battle against the Black Wings looming, Clara knows she must finally fulfil her destiny. But it won’t come without sacrifices and betrayal. In the riveting finale of the Unearthly series, Clara must decide her fate once and for all. What can I say? I need answers! Will Angela switch sides and become a dark angel? Will Christian continue to annoy me? Probably. Will Tucker and Clara get their HEA just like in that dream Clara had? I hope they do. By age sixteen, Rhine Ellery has four years left to live. She can thank modern science for this genetic time bomb. A botched effort to create a perfect race has left all males with a lifespan of 25 years, and females with a lifespan of 20 years. Geneticists are seeking a miracle antidote to restore the human race, desperate orphans crowd the population, crime and poverty have skyrocketed, and young girls are being kidnapped and sold as polygamous brides to bear more children. When Rhine is kidnapped and sold as a bride, she vows to do all she can to escape. Her husband, Linden, is hopelessly in love with her, and Rhine can’t bring herself to hate him as much as she’d like to. He opens her to a magical world of wealth and illusion she never thought existed, and it almost makes it possible to ignore the clock ticking away her short life. But Rhine quickly learns that not everything in her new husband’s strange world is what it seems. Her father-in-law, an eccentric doctor bent on finding the antidote, is hoarding corpses in the basement. Her fellow sister wives are to be trusted one day and feared the next, and Rhine is desperate to communicate to her twin brother that she is safe and alive. Will Rhine be able to escape--before her time runs out? 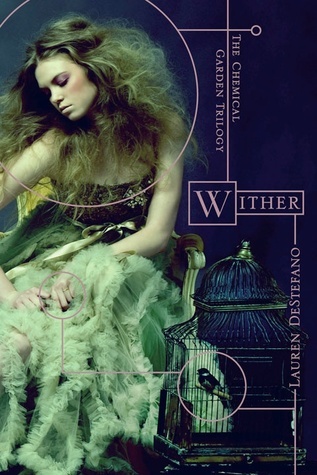 I have Wither and I loved it! Hope you get it soon! I can not wait for Boundless!! I love this series! It is one of my favorites. Great choice!